You can install Office 2010 from a disc or by downloading it. Because of potential backward compatibility issues the default installed version is 32-bit. However, if the 64-bit version is a better choice, follow the 64-bit installation procedure in this article. Note: For more information about the 64-bit version, see Choose the 64-bit or 32-bit version of Office. If you want to do a custom install or uninstall where you select only some apps, see the section below Install or remove individual Office programs or components. Insert the Office 2010 disc into the drive. If the setup wizard doesn’t start automatically, navigate to the disc drive and click SETUP.EXE. If you don’t have a disc, you can download and install Office with your product key. 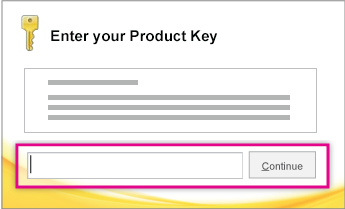 When prompted, enter the product key. If you need help, see Find your product key for Office 2010. 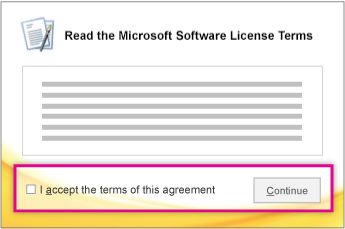 Read and accept the Microsoft Software License Terms, and then click Continue. Follow the prompts and after Office installs, click Close. 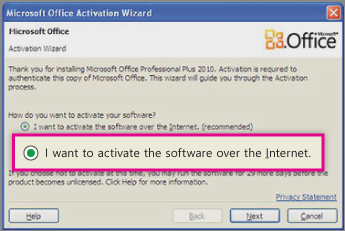 In the Activation wizard, click I want to activate the software over the Internet, and then follow the prompts. You’ll need to activate Office to keep your Office programs filly working. If you don’t activate it when you install, you can activate it later from an Office application by clicking File > Help > Activate Product Key. For more information, see Activate Office 2010 programs. You must be running 64-bit Windows. To check, see Which Windows operating system am I running?. Uninstall any 32-bit versions of Office. See Uninstall or remove Office 2010. Make sure any 3rd-party Office add-ins that you rely on are stated as being Office 2010 and 64-bit compatible. Possible backward incompatibility is why, if in doubt, stay with the 32-bit version. Insert the Office 2010 installation disc. Click Start, > Computer, and right-click in the disc drive where the Office 2010 installation disc was inserted, and select Open. 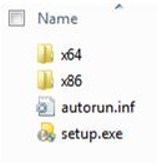 Open the x64 folder in the installation root, and then double-click setup.exe. After setup completes, continue by following the default installation instructions, by entering the product key (step 2). 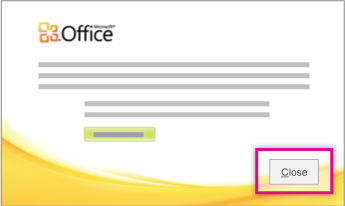 With Office 2010 you can install specific Office apps, or install specific Office components (features). If you only want to install certain programs from your Office suite - for example, you have Office Home and Business and want to install Word, Excel, PowerPoint and Outlook but not OneNote – you can choose a custom installation during setup. Initiate the installation of your Office suite. In the Choose the installation you want dialog box, click Customize. On the Installation Options tab, right click the programs that you do not want installed, and then click Not Available . Click Install now to complete the custom installation. Important: You can’t remove Office programs individually after the suite has been installed. You must uninstall Office completely, and then reinstall it using a custom installation following the steps outlined above. When you first try to use a feature that is not yet installed, Office usually installs the feature automatically. In Microsoft Windows, click the Start button, and then click Control Panel. Windows 7 and Windows Vista Click Programs, and then click Programs and Features. Click the name of the Microsoft Office suite or program you want to change, and then click Change. Note: In Classic view, double-click Programs and Features. Click the name of the Microsoft Office suite or program you want to change, and then click Change. Microsoft Windows XP Click Add or Remove Programs, and then click Change or Remove Programs. Click the name of the Microsoft Office suite or program you want to change, and then click Change. Note: In Classic view, double-click Add or Remove Programs, click the name of the Microsoft Office suite or program you want to change, and then click Change. In the Office Setup dialog box, click Add or Remove Features, and then click Next. Click a plus sign (+) to expand a folder and see more features. Run from My Computer The feature will be installed and stored on your hard disk when you complete Setup. Subfeatures won't be installed and stored on your hard disk. Run all from My Computer The feature and all of its subfeatures will be installed and stored on your hard disk when you complete Setup. Installed on First Use The feature will be installed on your hard disk when you use the feature for the first time. At that time, you may need access to the CD or network server that you originally installed from. This option may not be available for all features. Not Available The feature won't be installed because it is not available. If a feature has sub-features, a symbol with a white background indicates that the feature and all of its sub-features have the same installation method. A symbol with a gray background indicates that the feature and its sub-features have a combination of installation methods. You can also use the keyboard to browse through features and change feature options. Use the UP ARROW and DOWN ARROW keys to select features. Use the RIGHT ARROW key to expand a feature that contains one or more sub-features. Use the LEFT ARROW key to collapse an expanded feature. When you have selected the feature that you want to change, press SPACEBAR to display the menu of setup choices. Use the UP ARROW and DOWN ARROW keys to select the setup option that you want, and then press ENTER. Click Upgrade. This button appears if Setup detects an earlier version of the same Office program on your computer. Click Install Now. This button appears if Setup does not detect an earlier version of the same Office program on your computer.